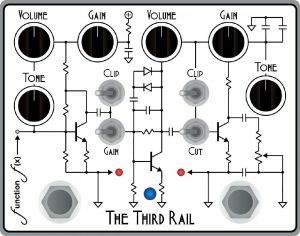 The Third Rail dual overdrive is our first foray into the overdrive realm. Our design objective was to create a versatile overdrive that could deliver a range of compression, saturation and touch sensitivity to excite the sophisticated ears of modern players. We quickly figured out that while our design sounded great on its own, putting two of the circuits in one box pretty well blew our minds and ears! Each channel can be run independent from one another or in series. Choose a single channel for rhythm playing or low gain leads. Slam both channels into action for high gain saturation and compression. We also give you three bypass modes to choose from: one channel on at a time, toggle between each channel, or switch both channels on at once (with momentary bypass on the second foot switch for stutter effects). Best of all, the Third Rail remembers which mode you prefer even if you unplug the power supply! Click here to download The Third Rail product manual.